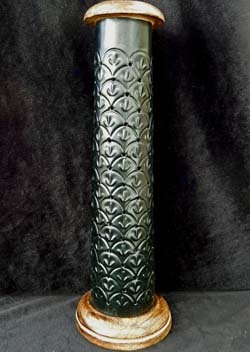 Steel Smoking Pillar - Burns incense sticks and cones. Unlike our towers, this pillar burns sticks upside down. The wood top removes to burns sticks in the attached key ring, or the bottom removes to burns cones. 12" tall and will accommodate sticks of 11" or less. Wood top and bottom, steel body in a semi gloss black finish.